Do you have to be bilingual to teach English abroad? No. Do you have to be bilingual to teach English abroad? A common question is how can you teach English abroad when you don't know the language? Wouldn't there be a language barrier? Shouldn't that be a requirement or qualification? Well, if you teach correctly you do not in most cases need to speak any of their language. Many schools will prefer that you do not speak any of their language. Many schools have an English only rule in the classroom or sometimes in the school. It's a good idea to learn the local language for life outside of the classroom, yet it's not needed in the classroom. How is it that I don't need to speak their language? If you are assuming that you would need to know the local language of the country that you are teaching English in then you are assuming that you would be teaching them with the grammar translation method. Grammar translation method? With this method you basically translate the word from their language to English. For example, you would say xie xie (Mandarin Chinese Pinyin) means "thank you". Yet that method is only one method of teaching English. For this post I won't go into those, but you can learn more on these methods with this online TEFL course. How about some real life examples of the materials that you will use to teach? 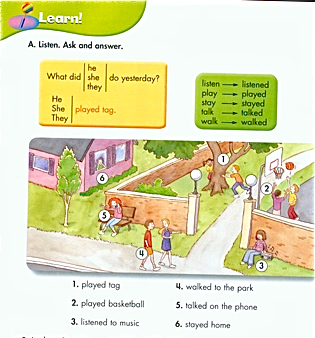 Let's take a look at what a page from a typical ESL student book looks like. This will give you some idea on how we can teach without using the students native language. 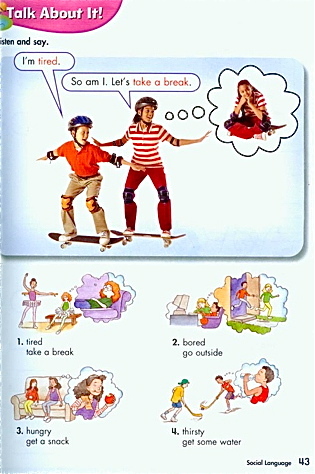 You can see that the students can see what the word "tired" and "take a break" means by looking at the pictures in Figure 1. This is a pretty standard ESL student book for teaching children. A lot of student books will have a similar layout to this. So the students can guess what the meaning of what a word is by using pictures. How do you teach the meaning of a word? objects - nothing better than using an actual apple to teach the word "apple"
body language - you can mime words like "run" or "make coffee"
kinds of - explain that the word is a kind of fruit, vegetable, etc. How do the students put it all together? Well they start with incremental bits. They started with the alphabet, phonics, vocabulary, sentences and then Q&A. They build to sentences and then to different tenses. Most of the students that you will be teaching will already have had some English instruction. In the above picture you can see how they are learning different tenses. They are also using substitutions for he, she, they, etc. and for played tag, listened to music, stayed home, etc. If you are not using a book you can still use substitutions to teach English. Here is a video with a few more examples. So you do not need to speak the local's native language wherever you are teaching English abroad. As long as your methods of teaching are good and you lesson plan then you shouldn't have any problem with it. Check out this online course for more on TEFL training. Learning the student's local language is a good idea for outside of the classroom though. It will make your life easier (less culture shock) and more interesting.